Steamboat Springs - Endurance relay racing cast a spell on Paul Vanderheiden in the middle of the night during his first Colorado Outward Bound Relay five years ago. "I fell in love with it on my third leg, running at 1 in the morning, feeling one of the more surrealistic experiences I've ever had, being out there running when you're totally exhausted in the moonlight," Vanderheiden said. "I was hooked right then." Since that unforgettable night, Vanderheiden has organized teams annually for the Outward Bound race and for three of America's other top relays. Now he has organized his own relay, a race that earned raves as it rolled across northern Colorado and southern Wyoming last weekend. With a 193-mile route broken into 36 legs averaging 5.4 miles, the inaugural Wild West Relay began with a staggered start Friday morning in Fort Collins and ended Saturday in Steamboat Springs. The race attracted 650 runners on 59 teams, including one with 10 Kiowa High School cross country runners that finished fourth overall. "I thought, what a great thing for a team to do together, kind of push the limits," said their coach, Jill Miller, who also ran in the race. "It worked out so much better than I ever imagined. They all want to do it again. It was phenomenal." After five rural legs north of Fort Collins the route began climbing through the foothills into a dense forest with occasional soaring views, then descended into the scenic Laramie River valley between the Laramie and Medicine Bow mountains. It penetrated 9 miles into Wyoming and then swung south into North Park, passing through Cowdrey and Walden, before heading over Rabbit Ears Pass into Steamboat. Like next month's Outward Bound relay (Sept. 16-17), the Wild West Relay was timed to coincide with a full moon, and the weather cooperated. Temperatures dipped to 33 degrees overnight, but the sky was clear and visibility was excellent. * 12x3: 12-person teams rotating with each runner responsible for three legs totaling 16 miles on average. * 6x6: Six-person teams rotating with each competitor running six legs, 32.1 miles per person. * 6x1: Six-person teams with each runner running one leg, 32.1 miles on average. Because relays make endurance racing possible for runners of so many sizes, shapes and paces, they are growing in popularity. "I describe team running relays as an adventure race for normal people, where it's not anything that exotic and you don't have to be a macho athlete to do it," Vanderheiden said. "The camaraderie that is built up in a van, supporting each other and rooting each other on - you have a rolling cheering section with you." Steve Krebs of Lakewood, a strong marathoner whose Phat Men Running team came in second overall and first in the 6x6 division with a time of 24 hours, 19 minutes, has competed in several Outward Bound relays and jumped at the chance to try out the new race. "When you leave high school or college, the concept of team is gone," said Krebs, who ran track for Wheat Ridge High School and Colorado State. "Running becomes this totally individual sport, which is cool in its own right, but the concept of relay produces the idea of team and teamwork. That's something you miss when you grow up." Dave Rulli of Lakewood, who competed on a 12-person team called Fil's Dirty Dozen, was an avid runner 20 years ago but slipped away from the sport. This relay intrigued him, so he signed up and started training. "It was the neatest thing I've ever done," said Rulli, 45. "I ran for 10 years - marathons, the Mount Evans Ascent - but this is unique. It's truly team." One of Rulli's teammates, Lorie Callahan of Golden, never had done any kind of endurance race but liked this one so much, she wants to do another. "It was very difficult, but I loved it," said Callahan, 43. "I liked the camaraderie, but also how kind every single group of people was, whether they were professional runners or amateurs like us. It was fantastic." 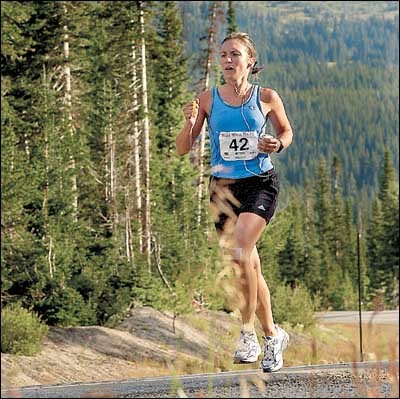 HOOD TO COAST RELAY, FRIDAY-SATURDAY: 197 miles from the summit of Mount Hood, Ore., to the Pacific Ocean at Seaside, Ore.; teams have minimum of eight runners, maximum of 12. * Originated in 1982, largest relay race in North America (12,000 runners). 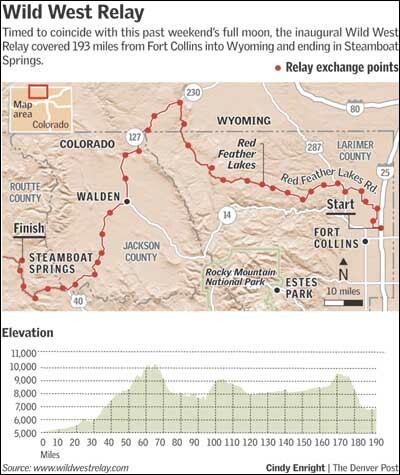 COLORADO OUTWARD BOUND RELAY, SEPT. 16-17: 170 miles, Idaho Springs to Glenwood Springs, crossing the Continental Divide on the ridge above the Loveland Ski Area; teams of five or 10 runners. * Originated in 1998, attracts 1,500 runners. REACH THE BEACH RELAY, SEPT. 16-17: 208 miles, Bretton Woods to Hampton Beach, N.H.; teams of six to 12 runners. * Originated in 1999, attracts 2,700 runners. THE RELAY, OCT. 15-16: 199 miles, Calistoga in Napa Valley to Santa Cruz, Calif., via the Golden Gate bridge; 12-member teams. * Originated in 1995, dubbed "California's longest party," attracts 3,500 runners. Staff writer John Meyer can be reached at 303-820-1616 or jmeyer@denverpost.com.